So where were we when we had our wonderful encounter with whales? I knew we must be in one of the few main waterways that carve their way through the islands of the Inside Passage because, very early in the morning, before we saw the whales, I’d seen this cargo barge being pulled along by a tug boat. As there are no roads into Juneau, this is the way most goods are moved around in this part of the world. 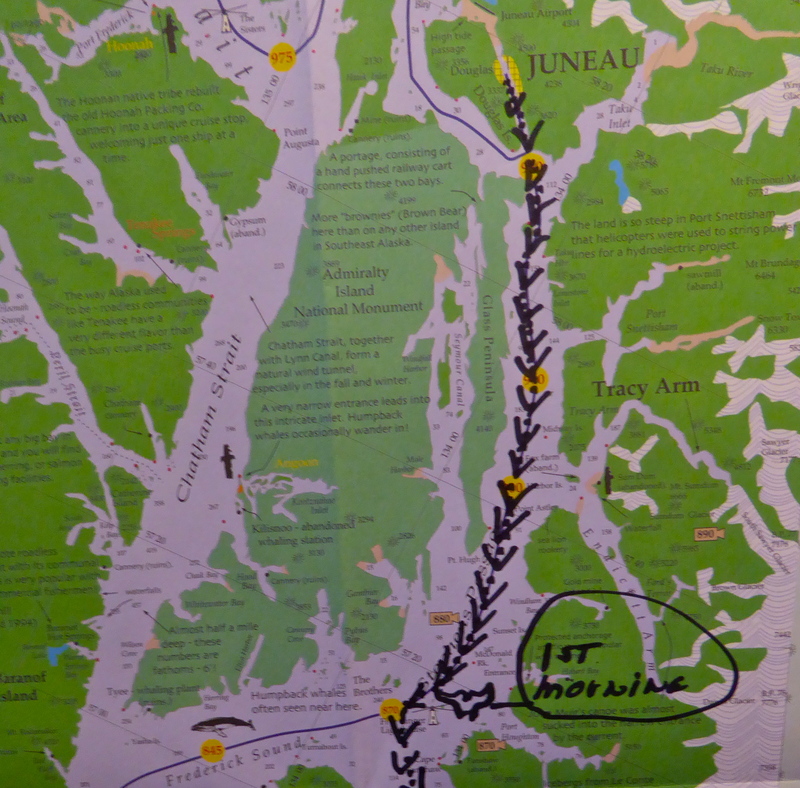 Overnight, we had sailed 105 km (65 ml) south from Juneau along Stephens Passage, the main shipping ‘highway’. The expedition’s very jovial professional wildlife photographer, Steve Morello, marked up the map with arrows and a ‘whale tail’ to pinpoint our encounter! The map is in greens because we were passing through Tongass National Forest… more about that forest later. On the map, right beside Steve’s whale tail, I noticed a lighthouse called Five Finger Lighthouse. Ah Ha! While watching the whales, I had spied that lighthouse in the distance and had taken a photo to try to pinpoint our position. It pays to look up from the exhilaration of whale spotting and take a look at your surroundings… occasionally, anyway! I’ve researched the Five Finger Lighthouse since and now know that: it’s been an active navigation beacon since 1902. The original timber building was burned down in 1933… (timber and naked flames are a bit hazardous, are they not?) A new concrete building was built during the Depression. It was completed and relit in 1935. The last resident light house keeper left in 1984 when the lighthouse was automated. Now the Coast Guard is in charge of maintenance. In 2004, Five Finger Lighthouse was put on the National Register of Historic Buildings. A Juneau based group of volunteers has taken on the task of restoring the lighthouse and out buildings. They hope to use the site as a whale research centre and for environmental educational purposes. That’s the summary. I’ve given the lighthouse web site at the end of this post. It includes some interesting stories for you to peruse at your leisure. While we enjoyed our breakfast, the Captain turned ‘Sea Lion’ away from the main shipping channel and began to sail through Frederick Sound, an area we were to explore for the next two days. First chartered in 1794 by two of Captain George Vancouver’s men, this sound was named in honour of Prince Frederick, Duke of York and Albany. During the morning we cruised south towards Le Conte Glacier. Whatever the afternoon brought for us, we were already very happy and well satisfied with our first morning encounter with those whales. Anything else would be a bonus! While many of the adults chose to spend the morning on the aft sun deck, young Brady found his special spot, perched in the bow with binoculars at the ready. He was one of 3 children on board, and by far the most inquisitive of the three. Brady’s dream is to become a naturalist and he certainly shows the right aptitude to reach his goal. The age range on board was from 80 to 6 years old…. the latter was a bit too young in my opinion. But he came with his family group; grandparents, parents, uncles, aunts and sister! There were quite a few smaller family groups, a great way to get together when family is spread across the length and breadth of the country. Most passengers came from the ‘Lower 48’ of the USA with one New Zealander and four of us from Australia. The sky was a clear and blue, the waters flat calm, the surrounding mountains were topped with snow. Here, we were a long way from the busy and sometimes worrying and chaotic world we had left behind. Here, there was not a house, not a telegraph pole in sight, not even another boat or ship. David and I chose to watch the stunningly beautiful scenery slip by from the walkway just outside our room. And what was our room like, I hear some say. Small, basic but comfortable. Two single beds with firm mattresses. A small shower/toilet room with a curtain to protect the latter from getting wet while we used the former. A basin in the bedroom. Plenty of hot clean water… potable water. A large window so that the scenery was always visible. All we needed. And, what we really loved was this… there were no locks on any doors! Oh, what a feeling of freedom! It was wonderful to be in an environment of complete trust. It reminded me of my life as a child, living in a tiny country village where no one had a lock; no one owned a key! We lived in trust, without fear of robbery or of ‘strangers’ who might wish us harm. How different the world is today. About halfway down the Sound, we caught site of a purse seining fishing boat. It had already strung its net in a circle, floats on the top side, weights below. The crew was waiting for the fish to gather within the circle. 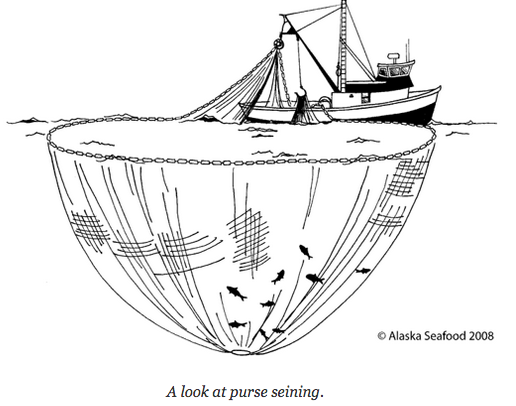 Then they would pull on the ropes attached to the lower part of the net to make the ‘purse’ that traps the fish. We cruised on, leaving them to their task. A description of purse seine fishing with good photos of each of the stages in the catch can be found on the web site given at the end of this post. The diagram above is taken from that site. Back to the peace of quiet cruising. Small ice chunks floated by, some in fantastical shapes. 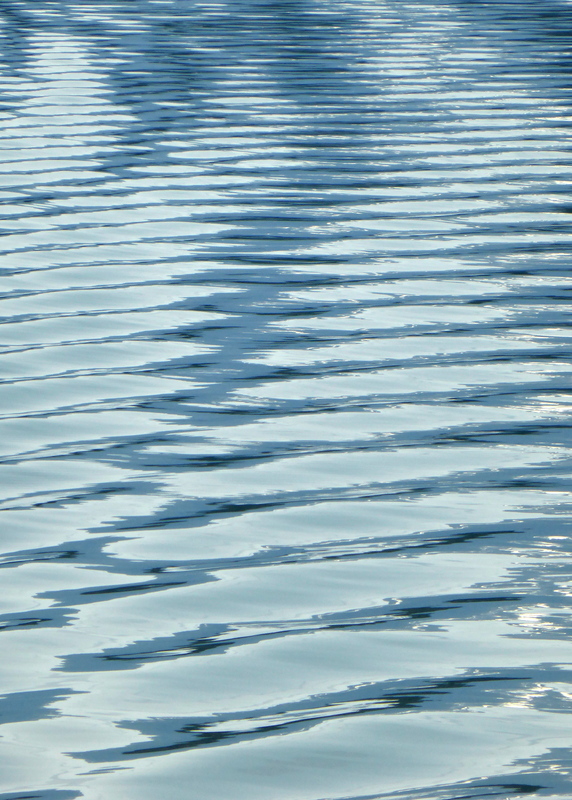 I lost my thoughts in the rhythmic movement of water patterns. especially from those cares that will not withdraw from us. David was also looking for water abstracts. taking a ride on a small ice flow… what a way to go! I moved back to my spot in front of the bridge. This was a much wider view. Many of the ice flows were now larger. We were getting ever closer to Le Conte Glacier Bay. The mountains were closing in on us… more ice flows appeared. And then lunch was served!